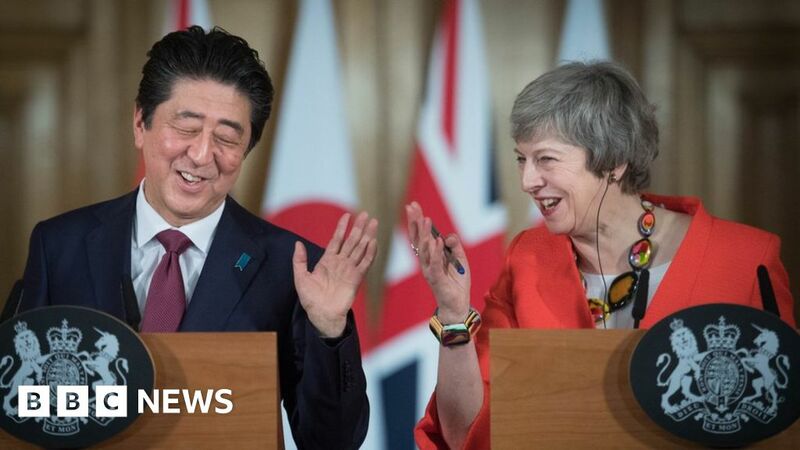 The “whole world” wants the UK to avoid a no-deal Brexit, Japan’s PM has claimed, after talks with Theresa May. Shinzo Abe pledged “total support” for the withdrawal agreement she has negotiated with the EU, which faces a crunch vote in the Commons on Tuesday. Mrs May has been speaking to Labour MPs and union leaders in a bid to try to get her deal through the Commons, where scores of her own MPs oppose it. It comes as Honda UK announced a six-day post Brexit shut down. The Japanese-owned car giant said the move was to ensure it could adjust to “all possible outcomes caused by logistics and border issues”. Mrs May said leaving the EU provided “an unprecedented opportunity” for the countries to strengthen relations. She and Mr Abe pledged to build on the trade agreement between Japan and the EU to secure an “ambitious bilateral arrangement” between Japan and the UK after Brexit. Mr Abe said: “It is the strong will of Japan to further develop this strong partnership with the UK, to invest more into your country and to enjoy further economic growth with the UK. “That is why we truly hope that a no-deal Brexit will be avoided, and in fact that is the whole wish of the whole world. The UK is set to leave the European Union on 29 March. The withdrawal agreement between the UK and EU – covering things like the “divorce bill”, expat citizens’ rights and a 20-month transition period – will only come into force if MPs back it in a vote. A no-deal Brexit would see the UK leave without a withdrawal agreement and start trading with the EU on the basis of World Trade Organization rules, an outcome favoured by some Brexiteers. The deal negotiated between the UK and EU looks set to be rejected by MPs next Tuesday, with 110 Conservative MPs having said they will oppose it, Labour set to vote against it and Labour Leader Jeremy Corbyn calling for a general election “at the earliest opportunity” – should it be voted down. “A government that cannot get its business through the House of Commons is no government at all,” he said. Mrs May has been speaking to some Labour MPs and the leaders of two of the UK’s biggest trade unions, Len McCluskey of Unite and Tim Roache of the GMB, in a bid to try to build support for the deal. It has emerged that the government is considering backing an amendment from Labour Leave supporter John Mann, giving extra protections to workers and the environment, in a bid to win support. She said the deal allowed for a “more ambitious trading arrangement between the European Union and the United Kingdom than they have entered into with any other third country” which would also allow the UK to “strike good trade deals on our own with countries around the world, like Japan”. Labour MP Martin Whitfield, a supporter of the Best for Britain campaign for another referendum, said: “It is humiliating for the prime minster to be told to her face that the whole world wants to avoid a no-deal scenario, yet she still refuses to rule it out. Meanwhile, during the second of five days of debate on the deal, Conservative MP George Freeman has told MPs he will now vote for it “with a heavy heart”, having previously said he could not support it. He said it “wasn’t perfect” but he would back it because “we are now in the dying stages and no deal is unconscionable”. Trade between the UK and Japan hit £28bn last year, and Japanese companies already employ 150,000 people in the UK. During their meeting in Downing Street, Mrs May and Mr Abe also discussed a number of joint projects, including research around conditions such as dementia and heart failure, the increasing use of big data and artificial intelligence, and environmentally friendly growth. They also made commitments on security – such as the UK deploying the Royal Navy warship HMS Montrose to the region to enforce sanctions against North Korea. And as part of a cultural exchange, the National Gallery will send a major exhibition to Japan, including the Sunflowers painting by Vincent Van Gogh. © 2014 WorldNewsPulse.com. All rights reserved.